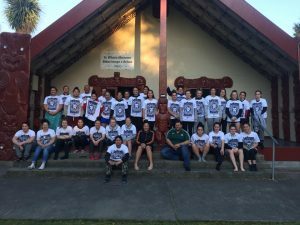 Rehua Marae had the pleasure of hosting the inaugural Maori Girls Rugby Camp over the period 24 – 26 August 2018. Approximately 32 young wahine from across Te Waipounamu; Murihiku, Otakou, Hakatere, Te Tai Poutini, Whakatu, Waiharakeke and Waitaha attended and thoroughly enjoyed the opportunity to meet other aspiring Maori rugby players in an environment supported with Tikanga Maori and using their passion to achieve in rugby as the vehicle. These camps are conducted through support from the NZRU. NZRU Kaumatua Luke Crawford, NZRU Maori Development Officer Tiki Edwards have supported the development of Maori rugby in the regions and at the rangatahi age groups for several years and it was pleasing the welcome them both onto Te Rehua. A big mihi also to the Camp organiser Kahu Carey CRFU and kaimahi Deano Williams, Melani Burchett, Jayson McRoberts, Matt Kiore and Dale Wairau; and a extra big mihi to Whaea Leigh Mouat.